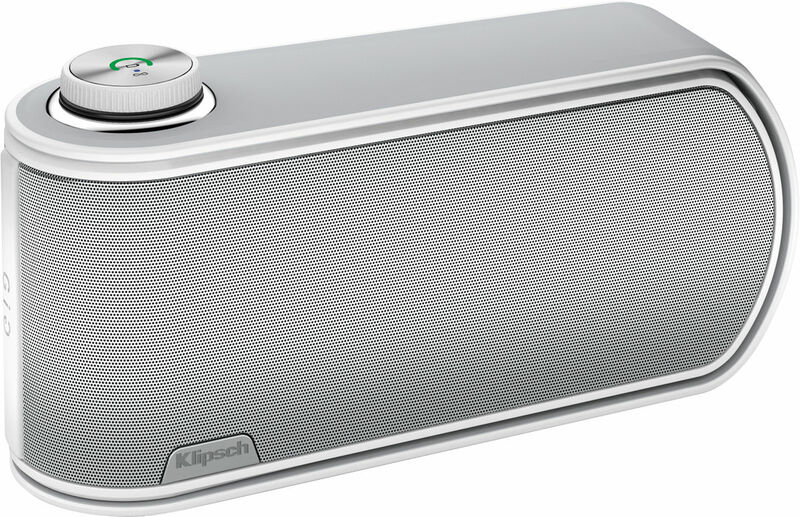 Klipsch finally made the jump to the Bluetooth wireless speaker market last year when it released KMC 3. Now, Klipsch has a new Bluetooth speaker on the market, the Gig. The Klipsch Gig may have a few awkward design aspects but overall, it is one of the most attractive wireless speakers on the market. Since the KMC 3 had impressive performance, particularly when it came to bass, expectations from Klipsch fans are high with the $199.99 Gig. There are four drivers present in the speaker, meaning that there is more than enough power present in the relatively small speaker for it to produce a booming sound. There are numerous Bluetooth speakers in the $200 price range but very few of them have enough power to create a rich overall sound and a good sounding bass like the Gig is able to. Klipsch did not try to make the Gig into anything too fancy and instead, it chose to design the Gig so that it would be a simple device, with the only stand-out design aspect is multiple color options. Just one multi-function button is included on the top of the Gig, which controls all of the playback, volume, and pairing functions. One of the few areas where the Klipsch Gig is not perfect is in pairing with Bluetooth devices. In most situations, reconnecting with a previously used phone, tablet, etc, is not difficult, but on occasion, the Gig simply has a hard time reconnecting. During the handful of times when this happens, it can take a little while to get the Gig to connect but it seems to occur very infrequently. This sort of connection issue is present with many Bluetooth devices but for $200, it would be nice to always have a flawless and quick setup. The lithium-ion battery included in the Gig is meant to last for 12 hours but just 4 hours at maximum volume. Even though using the speaker at max volume depletes the battery significantly faster, the Gig still lasts longer than the average Bluetooth wireless speaker. Actual performance with the Gig is great, even with a wide variety of genres. The bass is consistently good and while there are some Bluetooth speakers in the $200 price range with a little more power, the Gig stands with the best of them. Klipsch is usually a great brand for audio products and that is obvious with the Gig’s performance in most songs. However, when cranking up the volume or even just in higher registers, the sound quality is somewhat diminished. It is hard to escape distortion completely when you are dealing with a relatively small speaker such as the Klipsch Gig but in almost every situation, there is no distortion to be found. Unlike in regular reviews, the opinions present in “review overviews” are based upon a wide variety of user and technology/gaming publication reviews, creating a general opinion of the product/game.